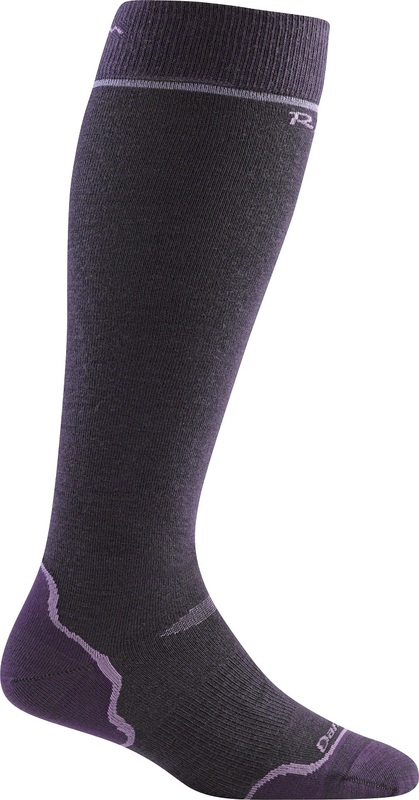 A performance ski sock made for a women’s foot. The RFL’s are thin, ultralight Merino wool socks that work great in close-fitting ski boots. RFL stands for Real-F’in-Light, meaning these are the lightest, thinnest socks in Darn Tough’s Vertical ski line. But that doesn’t mean they are weak, since like all Darn Tough socks, they are covered by a lifetime warranty. The socks have antimicrobial properties so you can get a few days use out of them before throwing them in the wash. The RFLs are form-fitting and breathable, making them a perfect companion for ski touring or racing. Part of Darn Tough’s Vertical series designed for ski boots. Regulates temperature, trapping heat and expelling moisture. Antimicrobial properties naturally repel bacteria and odor. Comfortable performance fit work for all day adventures. Made in Vermont by Americans who back up their work. Update 2018/19: The beloved RFL sock received a few updates beyond a change in colorways (now called Black / Purple instead of Nightshade). The instep panel has been tightened for better heel retention and the forefoot has been loosened just a touch to reduce toe fatigue and allow a more relaxed toe splay. Bottom line is that we didn’t think they could get more comfortable, but they did.